Modern wool rugs sold well at a winter New Jersey auction and are featured in a sale report in Kovels On Antiques & Collectibles April 2018 newsletter. Collectors who appreciate artistry with a practical purpose paid from $500 to $8,000 for contemporary rugs with distinctive patterns in bold colors that are a natural fit to today’s decorating trends. An Indianapolis auction, the fourth in a series that offered a private collection of about 3,000 pieces of costume jewelry, attracted a great deal of collector attention. Many of the pieces were by Marcel Boucher, known for his fanciful figural pins, often shaped like animals and people. Kovels’ April newsletter pictures examples of Boucher pins and prices, including one of his bold enamel and rhinestone fantasy bird pins that brought $2,400. And collectors looking for furniture with storage found great deals at a New Orleans auction. Decorative cabinets, sideboards and commodes sold for less than new modern pieces with open shelving. Find some elegant, useful examples in Kovels’ April issue. Circus memorabilia lovers stepped right up at a Florida auction where photographs, banners, furniture and costumes brought high bids. Kovels’ sale report pictures a pair of brightly patterned clown shoes that brought $500, a working calliaphone that went for $4,800, as well as other bits of circuses past. And authentic beaded Native American clothing is famous for its artistry and beauty. Kovels’ pictures vintage items handcrafted by American Indians that were sold in a winter online auction. Find vests, moccasins, and pouches and bags adorned with beads, quills, fur, shells, bone and feathers in symbolic patterns and their selling prices in the April issue. Kim Kovel goes “on the road” to Miami to enjoy an “old-fashioned antique show” and shares pictures of a variety of things that drew her attention. 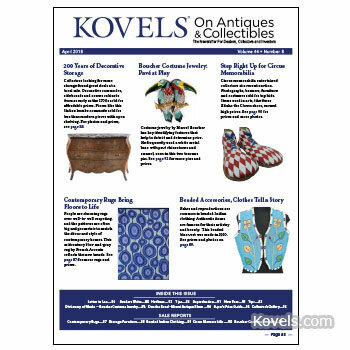 Kovels’ popular illustrated Collector’s Gallery answers readers’ questions about an egg cutter, a set of false teeth, an old Art Deco lamp and a puzzle jug. April’s Dictionary of Marks lists some of the marks found on Boucher costume jewelry. And more than 70 antiques and collectibles are listed in April’s Buyer’s Price Guide.